mining justice alliance | Grassroots organizing on Coast Salish Territories, in solidarity with global communities affected by Vancouver-based extractive corporations. 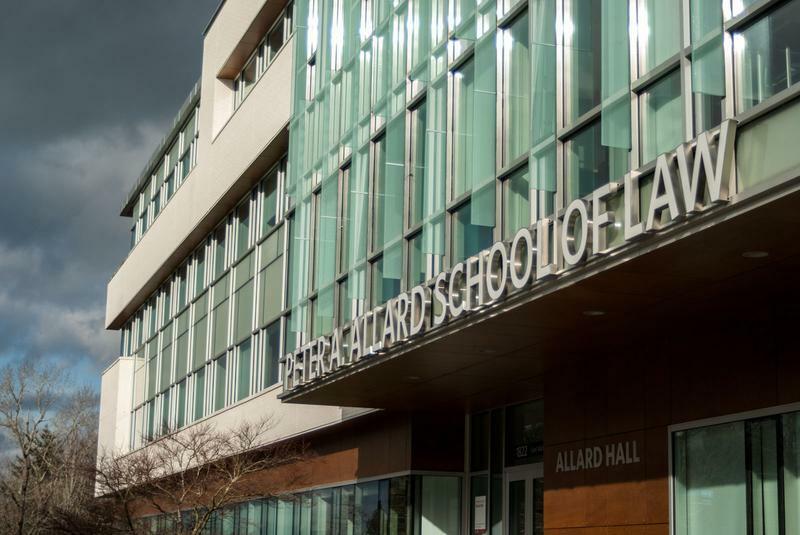 The Allard School of Law has halted the hiring process for a new faculty position created by an alumnus’ donation, after another alumnus expressed concerns about the principal donor’s alleged complicity in violating international law. The Allard School of Law announced on August 23 that it has accepted a $500,000 donation from alumnus Stuart “Tookie” Angus and his wife to create a faculty position in law and corporate social responsibility. This donation would then be matched by funding from Allard Faculty Recruitment and Retention endowment. Since then, concerns have been raised over Angus’ prior associations with mining companies that have faced allegations of violating international law, which led the school to pause the position’s hiring. In particular, Allard School of Law alumnus Hamish Stewart expressed this concern in a letter to The Ubyssey. “The history of this small sample of companies that Tookie has led raises a number of questions: is this the type of money the UBC Faculty of Law should be accepting on behalf of the UBC student and alumni community?” reads Stewart’s letter. Graduated from the Allard School of Law in 1973, Angus is the former board director of Nevsun Resources Ltd, a Canadian mining company that is currently facing lawsuits in the Supreme Court of Canada for alleged violations of international human rights law. In November 2014, four Eritrean mine workers have claimed that Nevsun was complicit in the use of forced labour, slavery and torture in the construction of a mine in Eritrea. Nevsun has denied the allegations and is appealing the British Columbia Court of Appeals’ decision to allow the lawsuit to proceed. None of the allegations have been proven in court. Nevsun did not respond to request for comment. Currently, Angus is chairman of a number of mining companies including K92 Mining Inc., Kenadyr Mining (Holdings) Corp. and San Marco Resources Inc. He left his position at Nevsun in 2017. Nevsun is not the only company that Angus has been on the board of that has faced allegations of human rights abuse. The United Nations issued a report in 2002, which accuses First Quantum Minerals of collusion and paying out Congolese officials for mining licenses and export permits. Angus was a director of the company from 1997 to 2005. As reported in a 2002 Globe and Mail article, First Quantum denied all allegations and asked the UN to retract them. “Over the past few weeks I have sought the views of members of the university community and from others who support the law school beyond the campus,” she wrote in a statement issued internally and shared with The Ubyssey on October 1. He also called for more public discussion on the matter. Angus could not be reached for comment following requests to K92 Mining Inc, Kenadyr Mining (Holdings) Corp. and San Marco Resources Inc. This article has been updated to correct a quote from Stewart to reflect that the allegation about complicity in human rights abuse has not been proven in court. The Marakame Margarito Diaz Gonzalez was murdered at his home, in front of his wife, on Saturday. The Indigenous Wixarika Marakame, spiritual leader and community security council member Margarito Diaz Gonzalez has been murdered in his home in Aguamilpa, Nayarit, western Mexico. People close to Diaz Gonzalez said he was at home with his wife when someone knocked on the door on Saturday. He was then shot in the face as he opened it. Despite being an important figure in his community, both in spiritual and political terms, the police didn’t open an investigation. It wasn’t until his funeral on Tuesday that the news emerged, putting pressure on the government. The Marakame dedicated his life to the preservation of the Wixarika culture and the defense of their ancestral territory in the face of continuous invasions by companies and landowners. He was a representative of his community at the Security Council of Wirikuta, aiming to protect the sacred desert lands to which Wixarikas peregrinate and which is under threat from Canadian mining companies. He was also a member of the Wixarika Union of Ceremonial Centers of Jalisco, Durango and Nayarit. His activism and prominent leadership among the Wixarika peoples had made him a well-known figure in the country’s Indigenous and environmental struggles, which often go hand-in-hand. Recently, Diaz Gonzalez was demanding authorities help the community and fence off 3.5 hectares of the Tatei Haramara sacred area because of recent incendiary attacks on the ceremonial center. The Wixarika people demanded the governor of Nayarit, Antonio Echevarria, investigate the crime, find the people responsible and respect Indigenous rights. In 2017, Miguel Vazquez and his brother Agustin, also prominent rights defenders in their community, were murdered in Kuruxi Manuwe, southern Jalisco. Wirikuta was declared a Natural Protected Area in 1994 and is regarded as sacred by the Wixarika people. However, since the 20th century the Mexican government has granted mining licenses in the territory, including 22 for the exploitation of silver and other minerals to the Canadian First Majestic Silver Corporation. None of these licenses were granted with previous consultation to the Wixarika people, a requisite according to Convention 169 of the International Labor Organization. Miguel Vázquez, a prominent land rights activist, was fatally shot by gunmen believed to work for the Jalisco New Generation cartel in the town of Tuxpan de Bolaños on May 20. His brother Agustín was killed after visiting him in the hospital that night. The Wixárika are not the only native group tired of being on the receiving end of government corruption and lawless drug cartels. 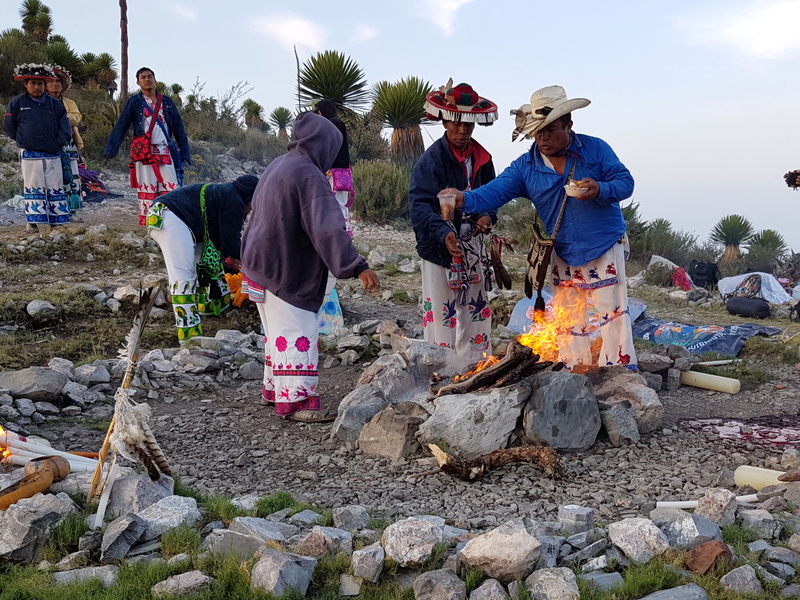 Last month Mexico’s National Indigenous Congress and the Zapatista National Liberation Army — Mayan descendants who led an uprising in 1994 and still control parts of Chiapas state — nominated a Nahua medicine woman to represent them in next year’s presidential elections. María de Jesús Patricio Martínez is the first indigenous woman to run for president, and her campaign is focused on drawing attention to the threats that the government, corporations, and criminal gangs pose to indigenous communities across Mexico. Patricio’s chances of winning the presidency are slim, but her symbolic run is aimed at creating a national support base to defend Mexico’s indigenous communities. Greater destruction looms over the Wixárika in the form of lucrative concessions to companies to mine their land. Despite the San Luis Potosí state government declaring it a Sacred Natural Area in 2001, Mexico’s federal government has continued handing out the concessions. But members of the Wixárika Regional Council, who have filed injunctions in a bid to revoke at least 78 concessions, said that mining causes severe environmental damage that puts their heritage and local ecosystems at risk. 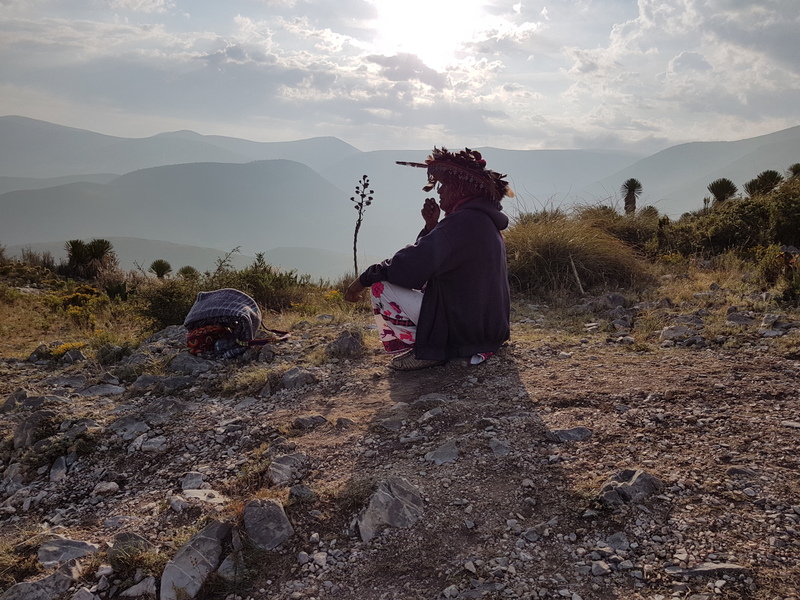 “We demand that the Mexican state cancel each and every one of the mining concessions in Wirikuta,” said councilor Aukwe Mijarez during the mountaintop ceremony. First Majestic’s Mexican subsidiary Minera Real Bonanza responded to these concerns, saying the company was “committed to supporting the preservation of the sacred sites of the Wixárika culture,” and was building wastewater treatment plants and had ceded 1,880 acres of concessions in the area closest to the Cerro Quemado. Read the full article, with many beautiful photos, here. OTTAWA — The Supreme Court of Canada will help decide whether a human-rights lawsuit against a Canadian mining company should be heard in British Columbia or Eritrea. The high court has agreed to hear an appeal by B.C.-based Nevsun Resources (TSX:NSU), which argues the East African country would be the more appropriate forum. Refugees from Eritrea allege they were forced to work at a gold mine controlled by subsidiaries of Nevsun and Eritrean state companies. They contend construction of the mine flouted international legal provisions against forced labour, slavery and torture — accusations that have not been tested in court. Nevsun denies that the company or a subsidiary enlisted the Eritrean military to build the mine or supply labour, and says the refugees behind the court action were not mistreated. B.C. courts have dismissed Nevsun’s attempts to make Eritrea the forum for any proceedings. An appeal court upheld a judge’s ruling that there was a real risk of corruption and unfairness in the Eritrean legal system, while acknowledging the considerable practical difficulties of hearing the claims in British Columbia. It was sheer coincidence, but more than a tinge of irony coloured yesterday’s news that the Supreme Court of Canada will hear Nevsun Resources’ appeal of a court ruling that accusations against it regarding the use of forced labour at its Bisha mine in Eritrea should be heard in British Columbia, not Eritrea, just as a new report revealed evidence of the Eritrean regime’s use of forced labour and exposed transnational mining companies’ contributions to supporting the regime. A group of Eritrean refugees allege that as military conscripts, they were forced to work for an Eritrean military contractor at Nevsun’s Bisha gold-copper mine, in violation of international laws against forced labour, slavery, and torture, and that Nevsun was complicit in their treatment. The allegations have not been tested in court. So far, Canadian courts have rejected Nevsun’s arguments that the case should be heard in Eritrea, not in B.C. where it is based. In November 2017, the B.C. Court of Appeal upheld lower court’s ruling that there was a real risk of corruption and unfairness in the Eritrean legal system, while acknowledging the considerable practical difficulties of hearing the claims in British Columbia. Since 1993, Eritrea has been ruled as a one-party state under the dictatorship of President Isaias Afwerki. There is no independent judiciary, civil society or independent media in the country, and the Constitution of Eritrea – ratified in 1997 – has never been fully implemented. As a result, many thousands flee into exile every month. At the age of 18, Eritrean citizens are drafted into compulsory indefinite military or national service. The UN Commission of Inquiry report found that most “are subject to forced labour” in public and private companies. Any foreign firm operating in Eritrea is required by law to contract public construction companies. The US State Department reported in 2015 that the country’s “mandatory national service programme,” and tendency to “place persons performing national service in commercial enterprises, may leave businesses open to charges of relying on conscripts as forced labour.” These concerns were echoed in 2016 and 2017. UN Security Council Resolution 2023 expressed concern that the mining sector was being used as a financial source “to destabilize the Horn of Africa”, and called on Eritrea to “show transparency in its public finances.” This has not been complied with. At least 17 mining and exploration companies – including from Australia, Canada, China, and the United Kingdom – currently operate in Eritrea. Of the approximately 1,500 people working for Nevsun Resources Ltd, which manages the Bisha mine west of Asmara, more than 1,400 are sub-contracted by Segen Construction. Segen, owned by the ruling party, is accused by Human Rights Watch of relying heavily on conscript labour. Nevsun’s 2016 financial statement showed that the company had paid more than $1bn in taxes to the Eritrean state since production began at the Bisha mine in 2011. Nevsun has “consistently cited confidentiality non-disclosure agreements” when questioned about its finances by the UN Monitoring Group on Eritrea and Somalia. First hand testimonies collected for this report found evidence of forced labour and torture. National Service conscripts were being subjected to abusive working and living conditions, hazardous working and living conditions, and the withholding of wages. At the time of writing, British investment management company M&G Investments, whose parent company is the insurance and financial services firm Prudential plc, holds almost 29 million shares (9.5%) in Nevsun. J.P. Morgan Asset Management, headquartered in the UK, holds shares in both Nevsun and Danakali, an Australian company engaged in a joint project with Eritrean state-owned mining firm ENAMCO. UK-based Andiamo Exploration currently holds an exploration licence for copper and gold in Eritrea. Major investors include Ortac Resources Ltd., whose own shareholders include the investment arms of Halifax and Barclays banks. Under Section 54 of the UK’s Modern Slavery Act 2015, every organisation operating in the UK with an annual turnover of £36m or more is required to produce a yearly slavery and human trafficking statement, setting out what action they have taken to ensure slavery is not taking place in their supply chains. If a business fails to produce a slavery and human trafficking report for a particular financial year, the Home Secretary may bring a High Court injunction requiring the company to comply. Failure to do so is punishable by an unlimited fine. There is currently no requirement for these reports to be independently audited. There is also no effective monitoring system to record which companies fail in their obligation to report, and no effective enforcement mechanism for compliance. The first recommendation is that the All-Party Parliamentary Group on Eritrea invites the company directors of M&G Investments/Prudential Plc, Ortac Resources Ltd, and JP Morgan UK, along with the relevant officials from the Foreign and Commonwealth Office who deal with the implementation of the United Nations Guiding Principles, to appear before the APPG to address the concerns raised in this report. The second recommendation is for the All-Party Parliamentary Group to write to M&G Investments/Prudential Plc, JP Morgan UK, Halifax and Barclays, to ask what steps they are taking to produce human rights impact assessments. The third recommendation is for the All-Party Parliamentary Group to ask the appropriate government departments what steps are being taken, in the light of the evidence of gross human rights violations, to ensure that measures in accordance with UK Anti-bribery legislation, the Modern Slavery Act, and the Extractive Industries Transparency Initiative are applied to company activities in Eritrea. The fourth recommendation is for the All-Party Parliamentary Group to issue a statement highlighting the abuses outlined in this report, publicly calling for companies to end their activities in Eritrea until there is a sustained and verifiable improvement in human rights within the country. The fifth recommendation is for the All-Party Parliamentary Group to write to the relevant ambassadors and High Commissioners of the countries in which companies operating in Eritrea, and their investors, are headquartered, raising the human rights concerns detailed in this report while at the same time remaining actively informed about the developments in Eritrea’s mining sector. The sixth recommendation is for the All-Party Parliamentary Group to write to the Foreign and Commonwealth Office and the Department for International Trade, asking what steps have been taken to force the provisions of UN Security Council Resolution 2023, and what the outcome of such advice has been. For details please see Mining and Repression in Eritrea: Corporate Complicity in Human Rights Abuses. Eight claims containing allegations of environmental or human rights abuse related to the overseas operations of Canadian extractive companies have been filed in Canadian courts. To date, no foreign plaintiff has been successful in a claim against a Canadian company in Canada. However, five cases involving foreign plaintiffs are before the courts. Two of these, Garcia v. Tahoe Resources and Araya v. Nevsun Resources Ltd., were filed in 2014. Three others, which were filed in 2010/11, involve the defendant Hudbay Minerals. In addition to the claims described above, Ecuadorian plaintiffs filed an action in Canada in 2012 that seeks to enforce an Ecuadorian judgment against a US extractive company. Both the US company and its Canadian subsidiary were named as defendants in the Canadian suit. Transnational suits face a number of legal challenges. First, foreign plaintiffs must establish that a Canadian court has the jurisdiction to hear their case. Jurisdiction refers to a court’s legal authority to adjudicate a matter. A plaintiff must establish that there is a substantial connection between the case and the province or territory over which the court presides. The same is true for cases brought before the federal court. Although a court may have jurisdiction over a transnational matter, it may decline to exercise that jurisdiction. The legal principle of forum non conveniens allows a court to dismiss a claim if it determines that another court is better positioned to adjudicate the case. A corporate defendant that seeks the dismissal of a claim on this basis may argue that the host state is a more appropriate venue due to its proximity to the parties, witnesses and/or evidence. The burden is on the plaintiffs to prove, on the contrary, that a foreign court is unable to provide them with a fair trial. corporations. The ‘corporate veil’ is a legal construct that treats a parent company and its subsidiaries as separate entities, shielding the former from liability associated with the latter. The separation is often fictitious, as parent companies are commonly involved in the management and operations of their subsidiaries. In order to hold a parent company responsible for the wrongdoing of its subsidiary, plaintiffs may argue that the veil does not apply. Alternatively, they may recognize the veil but seek to ‘lift’ or ‘pierce’ it in the circumstances. However, courts have often been reticent to remove the veil. Another approach is to seek to hold the parent company directly responsible for events overseas. Rather than argue that the parent company is responsible for the actions of its subsidiaries, this approach seeks to hold the parent responsible for its own acts and omissions regarding overseas operations. This basis of liability is currently being tested in the five transnational cases that are before Canadian courts. In Canadian common law jurisdictions (all but Quebec), the fact that a defendant company is registered or operates an establishment in the jurisdiction is sufficient to establish a substantial connection. Read the the whole brief here. Every year in May, the Mining Association of British Columbia (MABC) holds the “BC Mining Person of the Year Award” gala. Illustrious past winners include Pierre Lebel of Imperial Metals (Mount Polley Mine) and John McManus of Taseko Mines (New Prosperity Mine). This year, Mining Justice Alliance will hold our own gala to celebrate the recipients of the first ever BC Mining Resisters of the Year Awards. We will honour mining resisters who have stood up for rights, justice and self-determination, facing up to a powerful state-sponsored industry whose track record of injustice should not be celebrated. To find out more and nominate a BC Mining Resister of the Year, click here. What are the issues faced by the nominee and local communities? Water is life, and the lives of frontline communities in the province of Nueva Vizcaya are at stake with the depletion of their water table and pollution of their rivers from the aggressive operations of OceanaGold. For standing up against the Australian-Canadian mining giant, they have been met with militarization, harassment lawsuits, and illegal arrests from state authorities colluding with the province’s big mines. ANVIK remains uncowed by these attacks, as they continue to campaign against large-scale mining plunder in the face of tremendous odds. What is most important and inspiring about the nominee’s work? The ANVIK is the broadest and staunchest alliance of environmental advocates, church workers, indigenous communities, and other citizens in the province of Nueva Vizcaya. It has led the mounting of people’s barricades against mining exploration firm Royalco in 2013 to the expansion activities of OceanaGold in 2016. It has facilitated investigative and scientific missions to expose and oppose the destruction, pollution, and violence inflicted on the critical watersheds of Mt. Caraballo and the various communities it hosts. How have governments and the company responded? Local governments have recognized the advocacy of ANVIK and have recently joined efforts to investigate and oppose OceanaGold and other mining projects. OceanaGold itself was forced to indefinitely postpone its expansion and take strides in complying with environmental regulations because of ANVIK’s vigilance. However the organizers and conveners of ANVIK need international support and solidarity now more than ever, in the face of worsening militarization and human rights violations. International watchdog Global Witness in fact declared the Philippines as the second deadliest country in the world for environmental defenders in 2017. ANVIK’s organizers continue to struggle amid the heightening risks they face. The OceanaGold Corporation is one of the largest 100% foreign-owned big mining companies in the Philippines; these have caused massive water depletion and pollution. Oceana’s Didipio project covers 14,871 hectares of biodiversity corridors and watersheds in the province of Nueva Vizcaya, threatening the water supply of many downstream villages. 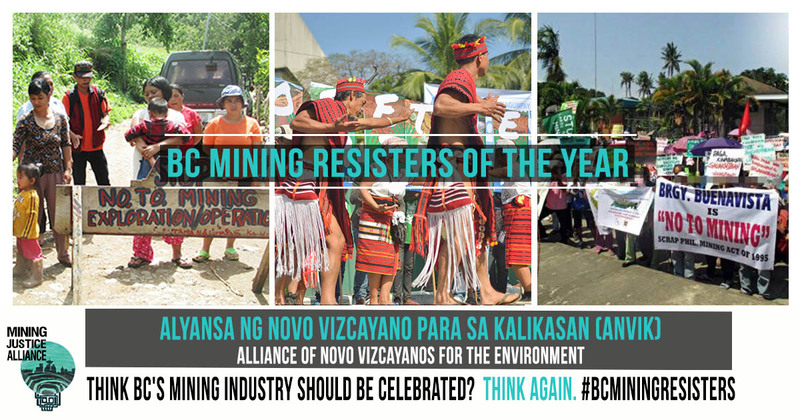 Join us to celebrate BC Mining Resisters of the Year at the GALA OF RESISTANCE on Monday, May 7th in Vancouver, BC.